The Blue Marlin is a trophy billfish that puts up a remarkable fight when hooked. The Blue Marlin (Makaira nigricans) is the largest trophy billfish and one of the biggest fish in the world. Common size is around 11 ft. (3.5 m) with a weight around 1.980 lbs. (900 kg) However females can exceed 14 ft. The smaller males, grow much slower than females and do not generally exceed 400 lbs., which is the species’ average weight. All trophy fish are females. 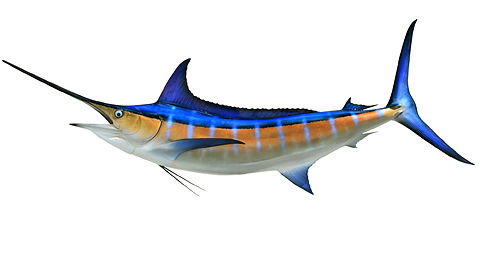 The Blue Marlin are so-called blue-water fish spending most of their lives far out at sea. It can be found worldwide and fishermen everywhere are looking to catch this elusive trophy known for its amazing power and strength. The cobalt blue body on top, with a silvery white belly, and the upper jaw is famously elongated like a spear. The tail is high and crescent-shaped and the dorsal fin is slightly pointed at the front end. The body is covered in embedded scales which end in one or two sharp points. The lateral line is reticulated, or interwoven like a net, but this characteristic is difficult to see in large specimens. This Marlin is usually found offshore in deep blue tropical and temperate waters. It is known to make regular seasonal migrations, moving toward the equator in winter and away again in the summer months. Additional migrations may span the entire Atlantic. Known for putting up a remarkable fight when hooked, these rare marine species are the holy grail for sport fishers.